There weren’t too many dull moments in the Facebook Marketing Conference event yesterday. After the announcement about the roll out of the Timeline for pages and the introduction to the company’s new Reach Generator advertising package, the social network presented another upgrade for its platform. Facebook confirmed that from the next couple of weeks the social network analysis tool for pages, Insights, will begin reporting almost in real-time, only in a few minutes delay. That is compared to the situation today, where page owners can only see the current time stats 3-5 DAYS later which in many cases make it pretty useless. That is major improvement for page owners that can now (from the time the upgrade will take effect) track and react close to real time occurrences of their Facebook page such as highlighting highly engaging posts and alter or even completely delete posts that generates negative reaction from the users. In our times when social posting has a very short existence, real-time measurement tool is a necessity. In a study from last year, it has been revealed that posts on Facebook mostly peaked in their first 3 hours since they published. Therefore, reporting latency of days after is pretty much worth to nothing in terms of optimization and reaction. The real-time reporting upgrade is another step Facebook is taking to attract businesses and to encourage them to promote and advertise their contents on the social network- With real-time Insights, businesses could recognize quickly which posts they should highlight by advertising. The last thing I want to talk about is the possibility that the real-time reporting may encourage website owners to install Insights as their site analysis tool. Yes, I know, it is lagging behind Google Analytics in almost any parameter. However, it still provides a familiar comfortable platform for webmasters. Click on the “Insights for your Website” button (marked with an arrow on the photo below). 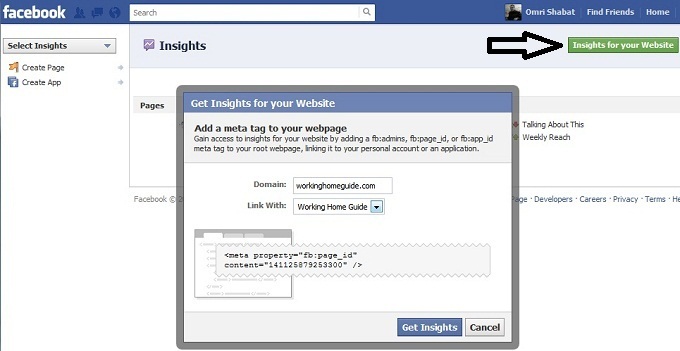 Type your domain and choose with which Facebook page/profile to link it with. Copy the code into the <head> part of your website. Click on the “Get Insights” to connect between your website to Insights.